And the last of the marine infantry. 4 Power Weapons and Bolt Pistols, 1 Bolter and Bionic Leg, 3 Combi-Meltas, 1 Combi-Flamer. 5 Bolt Pistols and Chain Swords, 3 Bolt Pistols and Power Fists, 2 Plasma Pistols and Power Weapons. 20 Bolt Pistols (a couple of Plasma Pistols) and Chain Swords. 5 Sternguard, 5 Assault Scouts, 4 Snipers 1 Heavy Bolter. 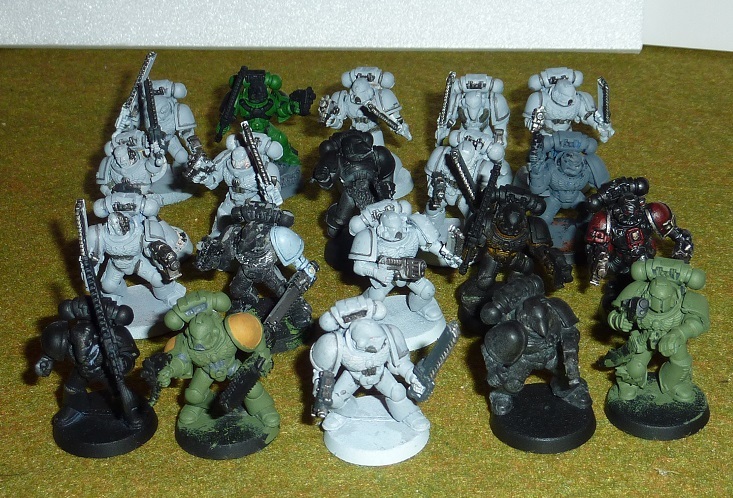 68 Tactical Marines with Bolters. There will be some vehicles posted up soon. Hello, I'm new to 40K and looking to get into Astra Militarum. Do you have any Steel Legion models? TTyson wrote: Hello, I'm new to 40K and looking to get into Astra Militarum. Do you have any Steel Legion models? Sorry, I don't. I have some of the plastic Cadians and Catachans, but I never bought any Steel Legion. I don't blame you Prim. I still don't think I've played 7th edition more than once if at all. 6th 2 or 3 times maybe? Spent loads on those books and a damn fine read and production value they were but I won't be shelling out. I like the new Genestealer models though so may buy a few of those at some stage once the backlog is cleared. I am finally looking to really expand my space marine force. I can probably take a lot of stuff off your hands. Particularly terminators. Auxryn wrote: I am finally looking to really expand my space marine force. I can probably take a lot of stuff off your hands. Particularly terminators. Kondo-san bought quite a lot of stuff from me a while back, so I'll see what I have still got and make a list for you. I've sent you a PM with details of what I have.